Languedoc-Roussillon villas with pools, gites, luxury cottages, holiday rental properties, self-catering accommodation to let in the Roussillon and Languedoc. Roussillon and Languedoc villas carefully handpicked for their quality and location. We view our villas first hand and contract them directly with the owners who are usually French locals. The southern Mediterranean region of Languedoc Roussillon has become a favourite with many villa holidaymakers in recent years as access has improved and the attractions of wide, long beaches backed by a fascinating mountainous hinterland have become increasingly obvious. The pace of life is slower than the Cote d'Azur and there are nothing like as many people. This is an area of great variety and contrast stretching from the untamed Camargue where white horses roam wild and pink flamingos feast in the shallow waters to the often snow-capped peaks of the Pyrenees on the Spanish border where eagles ride the thermals. And in between are miles and miles of gorgeous wide, sandy, Mediterranean beaches backed by beautiful hills shaped by dramatic rivers and adorned with vineyards. We have 9 villas in Languedoc Roussillon. Travelling to Languedoc Roussillon is relatively easy with very good motorway access for self-drive holidays. There are direct international flights to Nimes (FNI), Perpignan (PGF), Carcassonne (CCF), Montpellier (MPL) as well as Marseilles (MRS). Airlines flying to Languedoc-Roussillon include low-cost operators Ryanair and Flybe. Languedoc Roussillon enjoys a warm and sunny climate most of the year. 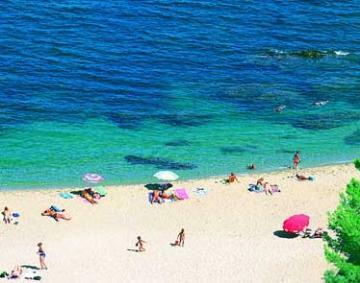 Temperatures are ideal for family holidays from May to September, it can get hot in the main school holiday months of July and August. There are many historic towns and cities which have been shaped and influenced by Romans, Moors and the Spanish, not seen elsewhere in France. 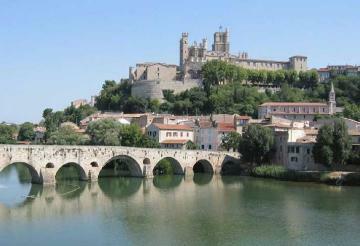 Mende, Nimes, Montpellier, Perpignan and Carcassonne are just a few which are well worth visiting. There are also a number of towns of exceptional beauty of which Aigues Mortes and Collioure are prime examples. The southern Mediterranean weather is generally excellent from early Easter right through to late October, occasionally interrupted by a day or so of strong winds coursing down the Rhone valley. The food in the Languedoc-Roussillon area is excellent, strong aioli from the Camargue combines with great value wines from the Pays d’Oc and wonderful oysters from Meze and many unique Catalonian dishes. There is lots of fresh seafood and sumptuous steaks. There is some wonderful walking in the hills and dramatic canoe/kayak descents down rivers such as the Gard, which passes under the astonishing Pont du Gard, a Roman aqueduct of breathtaking proportions. The Mediterranean sea is a playground for water sports of all sorts, particularly sailing, water skiing and windsurfing and what could be more romantic than horse riding through the shallow marshes of the Camargue. It's no wonder Languedoc-Roussillon villas are so popular.